Expert Advice on Top 6 Wedding Anniversary Gifts Questions! Choosing the right anniversary gift is tough enough, now the question is how to personalize it properly and appropriately? From names, to dates and special messages it can all get a little confusing! While personalizing a special gift please keep the recipient’s preference in mind, but overall it is personal preference and just what feels and sounds right! Here are our Expert Advice and Answers to our most frequently asked questions for Wedding Anniversary Gift giving and etiquette. Q1 – Is there specific wedding anniversary gift for each milestone? Yes! Celebrating an anniversary milestone can be a big deal whether it’s the first anniversary or the 50th there are special traditions and new modern themes! 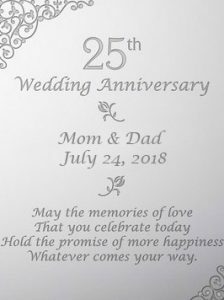 For example, the 25th wedding anniversary is celebrated with Silver, so personalized silver anniversary plate makes the perfect gift. Another common wedding anniversary gift is the prized golden 50th! Commemorated with the color gold, an engraved anniversary gold clock makes the perfect gift to symbolize the time spent together! You can find a complete list of wedding anniversary milestones and themes here. Q2 – What are the specific flowers for each wedding anniversary milestone? Flowers are a classic way of celebrating an anniversary! For every anniversary milestone, there are specific flowers to match and that represent a theme! A great example is the first wedding anniversary is represented by carnations which symbolize lasting vows and joy for the upcoming years. 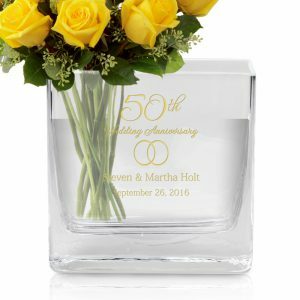 Another great example is the 50th wedding anniversary, represented by yellow roses that symbolize virtue, humility and faith. For a complete list of anniversary flowers and symbolism, check out this helpful blog post. Now, that you have the perfect flowers, we have the perfect vases for any anniversary milestone! Q3 – What date should a wedding anniversary gift be engraved or personalized with? Both the wedding date and anniversary date are appropriate for an anniversary gift. It is more common to use the current anniversary date, rather than the wedding date. 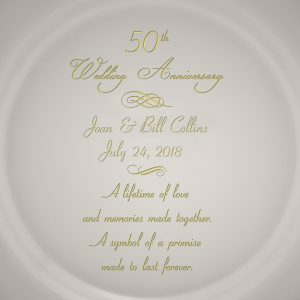 For example, if Joan and Bill Collins are celebrating their 50th wedding anniversary and got married on 7/24/1968 the date on the gift should be personalized with 7/24/2018 or July 24, 2018. Q4 – Whose name goes first on the wedding anniversary gift? The order of names is usually determined by the formality of the gift and just what sounds good! You can personalize with nicknames like Mom and Dad or Nana and PawPaw or you can use more formal surnames and titles. For example, if they like to use their titles, Dr. and Mrs. Bill Collins OR less formal but totally appropriate, Joan and Bill Collins. Q5 – Should you engrave who the gift is from on a weeding anniversary gift? Along with the recipient’s names and anniversary date, a lot of our anniversary items have the option to add an additional message. 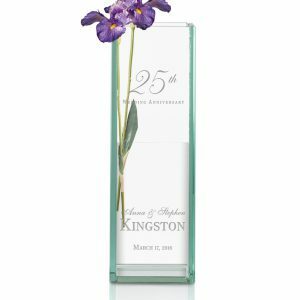 We find it best to keep other names and individuals omitted from the engraving to keep the focus and integrity of the anniversary gift. Adding who the gift is from in the message is a nice sentiment but can also clutter the engraving. Best is to add it to a gift card message with a special note from you just for them! Q6 – What is an appropriate message engraved on a wedding anniversary gift? Remember, the message for engraving is something that will be read and displayed prominently! Forego adding your name or others individuals names, to keep the engraving classic and uncluttered. We find that appropriate messages include, short sweet poem excerpts, treasured religious passages, or even a list of their familial accomplishments make a great message. If all else fails, we have a variety of appropriate example messages on all of our Anniversary items. If you would like the example message to be used, just enter the following into the personalization “Same as example” and we will use the same message shown. and the hopes of tomorrow. Here at Memorable Gifts, we have been in the gift-giving business for over 20 years and pride ourselves on our industry expertise! We carefully curate amazing gifts for all occasions and celebrations with original and unique designs. With thousands of satisfied customers over the years, we have learned the ins and outs of personalized gifts! How do you like to celebrate anniversaries? Do you have any special family traditions or gifts? Have you ever received a personalized wedding anniversary gift? We would love to hear how you celebrate this special occasion!